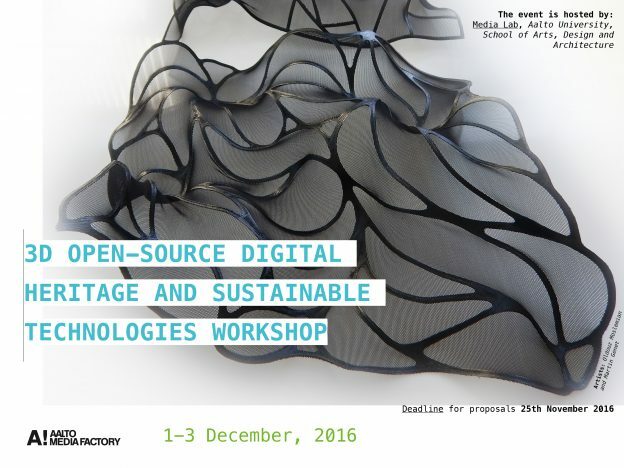 Aalto University, School of Arts, Design and Architecture’s Media Lab is hosting a workshop and training with public presentations and discussions on open source methodologies, practices and ideologies. The event will take place on 1-3 December, 2016 at the Aalto Media Factory (AMF) in Arabia. The objective of the workshop is to discuss key issues and hopefully come up with some guidelines that can help to make open source initiatives more feasible, successful, and sustainable. 17:00 – 20:00 Trashlab and pikkujoulu (little Christmas) party at Temporary.fi (BYOB). Submissions: Saara Mäntylä, saara.mantyla -at- aalto .fi. Textile and Collection Design and professor Jouni Partanen from Aalto ENG / ADDLab. This entry was posted in Art, Event, New Media, Practices on November 7, 2016 by Saara.